If you’ve got a craving for all things deep-fried, National Onion Ring Day is the holiday for you! On June 22, the nation celebrates the irresistible deliciousness of onion rings—often by eating as many of them as possible. It’s unclear when onion rings were first developed, but an onion ring-like recipe appeared in an 1802 cookbook, and another surfaced in a New York newspaper in 1910. Texas-based restaurant chain Kirbys Pig Stand claims it played a big part in onion rings’ creation, and fast food restaurant A&W helped them reach widespread popularity. There is still an ongoing debate over who deserves credit for the snack’s creation, and cooks also still argue about how to best prepare and serve onion rings for the most flavorful results. Some onion rings are even made from an onion paste, as opposed to an onion ring itself! This style of preparation can make it easier to eat the rings without accidentally yanking the onion out of the fried batter. However onion rings first came to be — and however you prefer yours prepared — they’re now a beloved snack across the U.S., the U.K., Canada, Australia, Ireland, South Africa, some regions of Asia, and other corners of the world. They’ve also inspired countless spin-off snacks, like blooming onions and Funyun chips. So no matter how you like them, grab a fried onion snack for National Onion Rings Day! Why not try making some onion rings in your own kitchen? You can try a classic fried recipe or you can try out a baked version of the snack. There are thousands of great onion ring recipes throughout the internet, so if these preparation styles aren’t your favorite, there’s certainly a recipe out there that’s perfect for you. You may even want to find one the old-fashioned way: in a cookbook! Pay a visit to your favorite local restaurant with friends and order a massive serving of onion rings. You can split them, or each order your own basket. (It's a holiday, so naturally, you're entitled to eat as many as you want.) 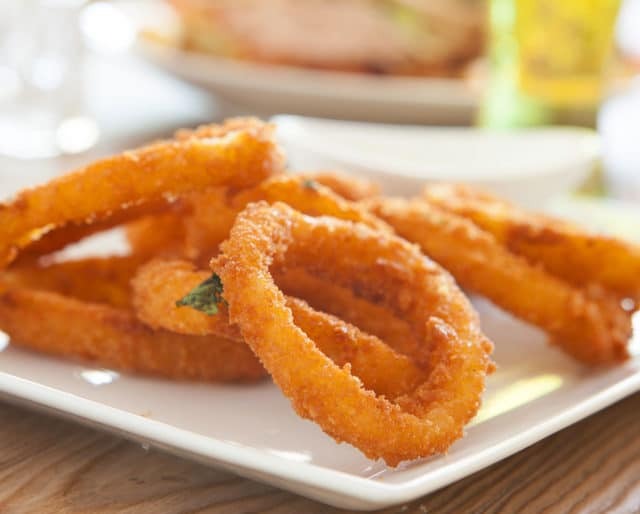 They’re often served as a side, but today, feel free to make onion rings the main event of your meal. Yum! Branch out by also snacking on fried Oreos, french fries, fried brie, fried chicken, and any other fried treats that you’re craving. This holiday is the one day when more grease is better! Eat up! Onion rings have become an important part of fast food culture. Sure, they're not as ubiquitous ad French fries, but that just makes them even more special. They're a hallmark of American culture, there’s nothing more American than kicking back with a burger and some onion rings and soda, especially when you’re in the company of friends. Before onion rings were created, who could have imagined that a food known for its bitterness could be so sweet and tasty? When a new food takes off like wildfire, it inspires more culinary creativity. Onion rings’ widespread success was an early precursor to modern food trends, like cronuts and rainbow bagels. There are hundreds of recipes for preparing onion rings at home, and several hundred spin-off recipes that put a new twist on the traditional favorite. Deep friers are a kitchen appliance that are usually relegated to the back cabinet, but when an onion ring craving leads to an impromptu fry session, they get their time to shine.